Apr 16 2016: I donated £30 (about $43 USD) to Kumamoto Japan Earthquake Relief Fund by GlobalGivingUK. Oct 10 2014: I donated $20 to Japan Earthquake and Tsunami Relief Fund by a GlobalGiving Project. Thank you. May 01 2013: I donated 2000yen (about $21 USD) to Japanese Red Cross. Thank you so much for your support. 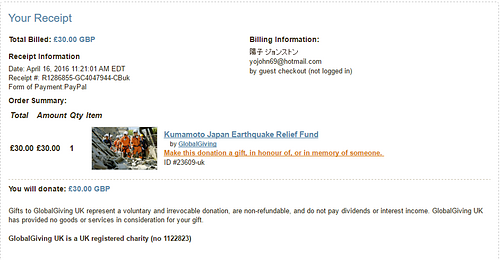 Oct 17 2012: I donated 2500yen (about $32 USD) to Japanese Red Cross. Thank you so much for your support. Dec 29 2011: I’ve ordered 15 gas cartridges (2625yen) for a shelter in Ogatu Forest Park in Isinomaki-city in Miyagi prefecture, where, i read, there is no kitchen or no stove to boil water. The order was made through an Amazon Japan’s project for Touhoku Japan, “ Wish Lists for Japan Earthquake”. I chose to use Amazon because we can meet victims’ need right away, sending things they need now. May 04 2011: I just sent my first 7000yen (about $86 USD) donation to JAPANESE RED CROSS. (For confirmation of the payment, please see the photo at the bottom of this pg) Thank you so much! I will donate the proceeds from this pattern’s sale to for the Earthquake/Tsunami Relief effort in Japan. For long term recovery efforts, Japan needs more donation money and support. I haven’t set a closing time for the donation yet. 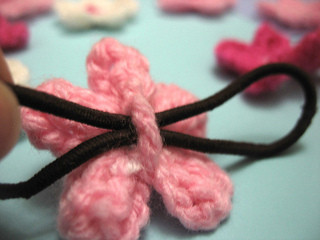 I made the SAKURA motif pattern to help fundraising, wishing for Japan’s recovery and smiles on the people’ faces. I really appreciate your support for people of Japan, as my heart is always with them. 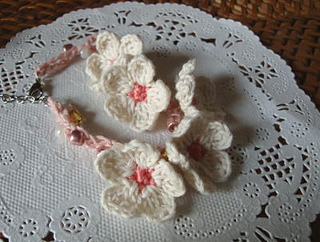 This is an easy and versatile pattern. 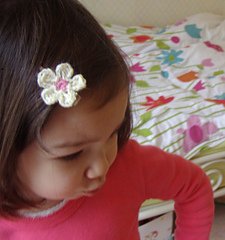 Since there is a connection band at the back of the flower, you can put a stick in the band and do flower arranging. Or, convert to a hair band, or a drawing pin. This is my first attempt at writing and releasing a pattern. It took me a long time to learn how to create a PDF file and draw a chart using CAD. joujouka kindly offered to help me. My sincere thanks to her again.